Discussion in 'Bass Area; The Bottom Line' started by crashcat123, Apr 17, 2016. So I'm searching for a p bass, and I've got about a 1100$ budget. I'm really looking for a smooth warm sound. 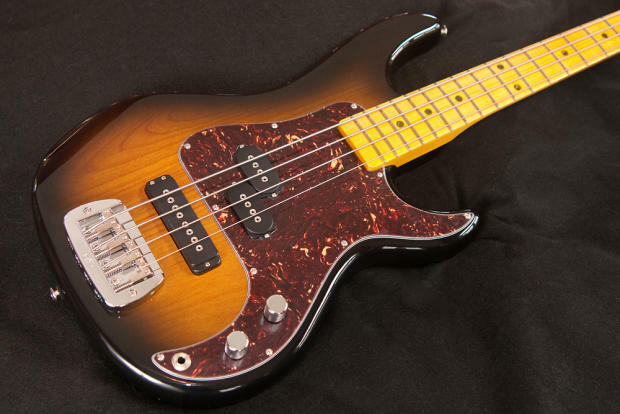 I've been looking at fender American standard p basses but I'm wondering if there's any other options around that price range with that good p bass sound. used alleva coppolo, mike lull, Lakland - duck dunn/bob glaub/4464. dingwall super P if you want something a bit different. New Lakland Skyline 4464. Another voice for Lakland. I just acquired a 2014 44-64 P-bass and it sounds and plays great. In your price range too. Look for a used one. If you see any of these under $1100, please shoot me a PM and let me know where! But, yes... At this price point, Used Fender USA is a solid bet. A P-bass is one of those things you almost can't screw up. They all "have that good P-bass sound", from the vintage reissues down through the MIM and Squiers. Find one that plays and looks like you want and the "tone" is going to be more a matter of string and possibly pickup choice. For more "vintage" tones I would avoid active electronics and "upgraded" hardware. Leo got it right, IMO. Mighty Melvin and dirk_benedict like this. The last one that I tried that really knocked me out was a Fender road worn. Light weight, wide neck, bright and ringy to mellow with the tone control. Good luck. Find your own because they do vary. Would getting a warmoth neck and body be a bad idea? Haven't heard much about them but it's pretty cheap to custom build a body and neck. only bad thing I've heard about warmoth is poor resale so if its a keeper bass you're all good. Don't hate me for this; but check out the new Fender Elite P-Bass... Your budget will not like this idea though! ($1,799 and $1,899) I have been having a mad G.A.S. attack over these..
Or the '58 vintage which also looks sweet! Get a used American SB-2, or a Tribute SB-2. There's also an SB-1, if you want only the P, and no J. Those MFD pickups in there are very high output & they are built like a tank. SIX screws to hold the neck on. G&L is Leo Fender's final company, where he perfected his designs. American Standard is American standard. With that said, I enjoyed gigging with a Mexican standard as well as 60s classic. They all deliver. You can pickup a '58 AVRI used for about $1200.00. NOS nitro finish, fat neck it's a very nice bass. A friend just bought his used off the GC site. It's practically brand new. That G&L is just hideous. so to cut to the chase ; is it that you want a different look to go with that sound ??? could be a used one out there at your price ! I bought a gorgeous used 2009 American Standard Precision Bass by running the rental racks at a Long & McQuade (Canada's answer to GC) in Vancouver. It cost me $850, including hardshall case and case candy. If you're looking for the "smooth, warm sound" then just make sure you have the right pickup. High-output pickups (like the DiMarzio) will give you more of a '70s Rock tone. And forget about Duncan Quarter Pounders: they trade the classic PBass midrange honk for extra lows. Very "modern" sounding. Besides that, consider flat wound strings. Don't mess around, get a Lakland skyline. If you're looking for the "smooth, warm sound" .... consider flat wound strings. LaBella, T.I. Jazz flats & Chromes are all variations, but they'll get the job done. Personally I sold off my USA standard P, but that bass would definitely do what you're asking for. I'm running a Maton JB4 for those tones these days.